It doesn’t use Kinect – Try as developers might Kinect just doesn’t work as a racing controller. Disagree? Try Sonic Free Riders, the Kinect-based driving of Forza Motorsport 4, podracing in Kinect Star Wars, or even Kinect Joy Ride. In all those examples your arms tire quickly, and even if they don’t good luck getting the controls to respond they way you think they should. We love Kinect, but so far nobody has mastered using it in racing games. Thankfully Turbo ditches the WALL-E shaped controller for good ole’ thumbsticks and triggers. The result is that the game plays as it should, and boy, does it play buttery smooth. 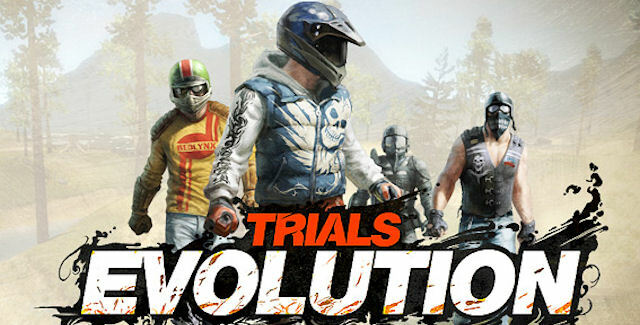 You’ll feel like you’re in control with every action made; turns, boosts, braking, stunts and firing projectiles all feel like second nature, and they all respond just as you’d expect them to. A full bag – Remember as a kid when you’d pack for vacation? Your suitcase was so full of what you needed and loved that you sat on it while your mom zipped it shut. Joy Ride Turbo is like that. It’s got Mario Kart-style cups, a stunt mode, plus online and local multiplayer. There are a so many tracks, cars and unlockables for 800 MSP that you’ll wonder how many folks at BigPark effectively held the lid down while someone closed the container. A worthy competitor – Since 2001 when the original Xbox hit shelves consumers have begged for a competent Mario Kart clone. Many games tried to hit that mark, Crash Nitro Kart, Cars 2 and Sonic & Sega All-Stars being three of the best examples. Still, neither of those hit the mark. They were great, sure, but for their retail price they just couldn’t beat the plumber at his own game. Joy Ride Turbo succeeds. 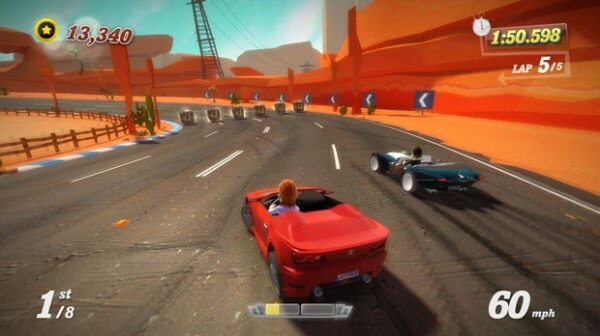 After the release of Kinect Joy Ride BigPark and Microsoft knew what they had on their hands. This wasn’t a retail-price Nintendo killer, it was an amazing-yet-budget-priced game. At 800 MSP Turbo not only stacks up to, but dethrones Mario Kart 7 as the best bang for your buck ‘karting’ game around. Modify! 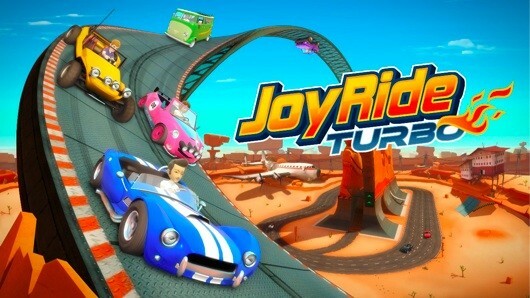 – Joy Ride Turbo comes out of the virtual box with 15 different vehicles, and each of those vehicles is semi-customizable. Make no mistake, Need for Speed: Underground this ain’t. That being said each vehicle has three different ‘stages’ it can be changed to by finding hidden collectables, winning races, and spending hard earned points. Every vehicle also has roughly 10 different colors to choose from, so even the pickiest of players will be able to find their ideal car configuration. 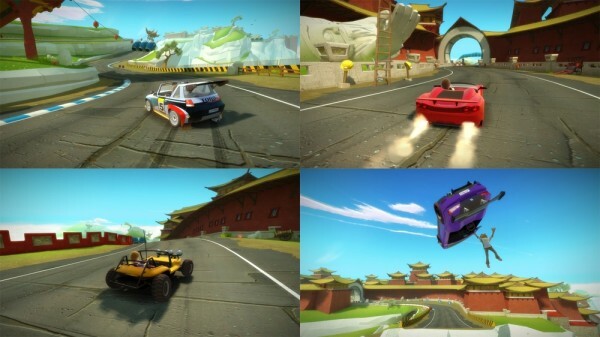 Stunt mode – The first time you take a spin around Turbo‘s stunt mode you’ll be hooked. The stunt parks are large and filled with things to do. Even after a good 20 minutes we still found ourselves finding hidden routes and finding new ways to chain combos. There are also a handful of AI vehicles driving around and a few aggressive powerups. Need a moment to recover after botching a huge jump? Grab some rockets and take out some poor unsuspecting driver as they pass by. 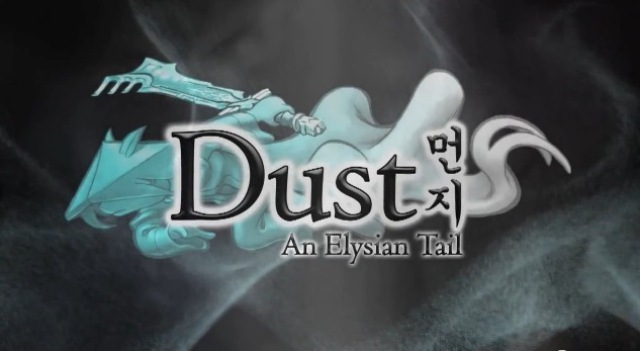 Art style – BigPark took the art style derived from the Xbox LIVE avatars and really ran with it. 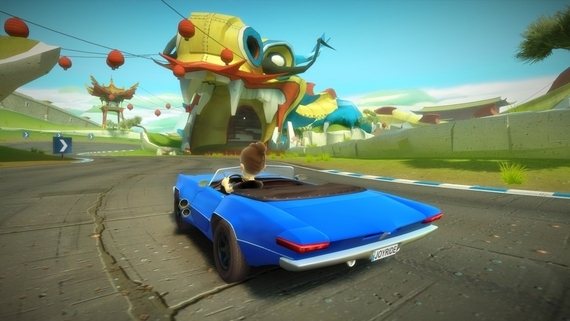 The gameplay world is rich and vibrant, the cars have recognizable qualities yet retain a cartoon appearance. The over-the-top jumps, loops, and corkscrews will leave you gripping your controller just a little tighter as you navigate the zany environments. We love it–so much so that we hope Microsoft uses this world as a template for any future official avatar-based games. Brown is my favorite color – We’re not talking that dingy next-gen brown. Thankfully the rendering plague of this generation is nowhere to be found. No, Joy Ride Turbo just seems to like that color. While the environments do actually vary you’ll find that the larger part consist of an orangish-brown template that can, after the tenth track themed as such, get old. But hey, if that’s the worst we can find, that’s pretty impressive, right? Slim pickinz’ at the start – Okay, so we have one other gripe. When you fire up the game for the first time you’ll have access to only one car with only one paintjob and zero upgrades. After finishing the other beginner level cups you won’t have many more added to your selection. While the game is oodles of fun those looking to unlock vehicles may find that it grinds on from time to time. All we have to say is that if DLC comes out for Turbo (none has been announced as of this writing) the cars had better be unlocked out of the gate. Look no further for your karting needs. While technically you’ll be driving cars, you’ll find there isn’t an Xbox 360 karting game that gives you more enjoyment, retail or otherwise. Sonic & Sega All-Stars and Cars 2 both offer great karting gameplay with licensed properties, but if you don’t require a blue hedgehog or rusty tow truck as part of your character set you’re better off paying a sixth of the price for a game that’s just as good, if not better than its retail counterparts.